Russian pilot cosmonaut, 1997-on. 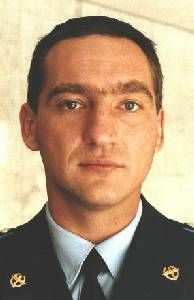 Son of cosmonaut Aleksandr Skvortsov. Status: Active 1997-on. Born: 1966-05-06. Spaceflights: 2 . Total time in space: 345.27 days. Birth Place: Zelenyi Gorodok, Moscow. Graduated from Stavropol Sudets Higher Air Engineering School of the Air Defense, 1987. Graduated from Academy of Air Defense, Tver, 1997. Air Defence Force. Cosmonaut from 1997-07-28. Cosmonaut training completed November 19, 1999. PERSONAL DATA: Born May 6, 1966, in Schelkovo, Moscow Region. Married to Skvortsova (nee Krasnikova) Elena Georgievna. They have one daughter, Anna. Hobbies include diving, soccer, badminton, fishing, hunting, and tourism. EDUCATION: Graduated from the Stavropol Air Force Pilot and Navigator School as pilot-engineer in 1987, and in 1997 from the Military Red Banner ZhukovAir Defense Academy. Currently working on a law degree at the Russian Academy of Civil Service. EXPERIENCE: Skvortsov flew L-39, МiG-23 and Su-27 aircraft as a pilot, senior pilot and chief of aircraft formation. . Skvortsov has logged around 1000 hours of flight time. He is a Class 1 Air Force pilot, a qualified diver and paraborne instructor. SPACEFLIGHT TRAINING: Skvortsov was selected as a GCTC cosmonaut-candidate in 1997. From January 1998 to November 1999 he participated in basic spaceflight training. Skvortsov received the qualification of a test-cosmonaut in November, 1999. In January 2000 he started ISS advanced training. Starting March 2008 he trained with the ISS 21/22 backup crew as a flight engineer and Soyuz TMA commander. Since October 2009 he has trained as an ISS 23/24 crewmember - Soyuz commander, ISS 23 flight engineer and ISS 24 commander. He currently lives and works aboard the International Space Station having launched aboard Soyuz TMA-18 on April 2, 2010. Family: Cosmonaut. Country: Russia. Flights: Soyuz TMA-18. Agency: PVO. Bibliography: 4452, 6038. Birth of Aleksandr Aleksandrovich Jr Skvortsov - . Nation: Russia. Related Persons: Skvortsov, Aleksandr. Russian pilot cosmonaut, 1997-on. Son of cosmonaut Aleksandr Skvortsov. 2 spaceflights, 345.3 days in space..
2010 April 2 - . 04:04 GMT - . Launch Site: Baikonur. Launch Complex: Baikonur LC1. LV Family: R-7. Launch Vehicle: Soyuz-FG. Soyuz TMA-18 - . Call Sign: Cliff. Crew: Caldwell, Korniyenko, Skvortsov, Aleksandr. Backup Crew: Borisenko, Andrei, Kelly, Scott, Samokutyayev. Payload: Soyuz 7K-STMA s/n 228. Mass: 7,200 kg (15,800 lb). Nation: Russia. Agency: RKA. Program: ISS. Class: Manned. Type: Manned spacecraft. Flight: Soyuz TMA-18. Spacecraft Bus: Soyuz. Spacecraft: Soyuz TMA. Duration: 176.05 days. Decay Date: 2010-04-20 . USAF Sat Cat: 36505 . COSPAR: 2010-011A. Apogee: 361 km (224 mi). Perigee: 350 km (210 mi). Inclination: 51.60 deg. Period: 91.60 min. ISS EO-23. The crew first attempted to depart the ISS on 24 September. However the latches between the Soyuz and the station failed to release. Return to earth the next day was successful, with undocking at 02:03 GMT; deorbit burn at 04:31 GMT; and landing in Kazakhstan at 05:23 GMT.